Just as the question says, I can't get my StudioLive Mixer to connect with my PC Firewire 800 port. There could be an issue where the firewire card driver has been set to receive "automatic updates" to the "best"
FireStudio Project and Mobile devices, this drive might not always work. 1. Power off your PreSonus FireStudio interface or StudioLive mixer. 2. Find your FireWire (IEEE 1394) controller in Device Manager (go to Start > Control Panel > System > Device Manager). 3. Open the IEEE 1394 Bus Host Controllers group with the "Unibrain Driver." 4. Right-click on your FireWire controller and choose "Update driver Software..."
5. Use the "Browse my computer..." option. 6. Choose the "Let me Pick from a List" option. 6. If you are on a Windows 7 system, it is suggested that you would want to us the "Legacy" option depicted. information on why you would want to choose this option can be found here. If you are using a Windows 8, 8.1 or 10 machine, you can use the native "OHCI Compliant Host Controller." Why will UC no longer launch for my StudioLive mixer / FireStudio after installing UC-AI for a new StudioLive-AI mixer? How Do I know my StudioLive (Ai) is connected to my computer and functioning over firewire? How do I properly connect my StudioLive to my PC? 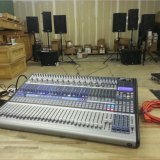 How do I setup my Windows Audio with a StudioLive Ai Console or Rack Mixer? Why will my StudioLive Mixer not Connect to my PC Firewire 800 Port? new generation of notebook windows, there are no FireWire or PCMCIA ports, how can we connect StudioLive mixer?